"The Making of the Modern Vice Presidency: A Personal Reflection," by Richard Moe. In Minnesota History, vol. 60, no. 3 (fall 2006), pages 88-99. Mondale: Portrait of an American Politician, by Finlay Lewis. The Good Fight: A Life in Liberal Politics, by Walter F. Mondale. 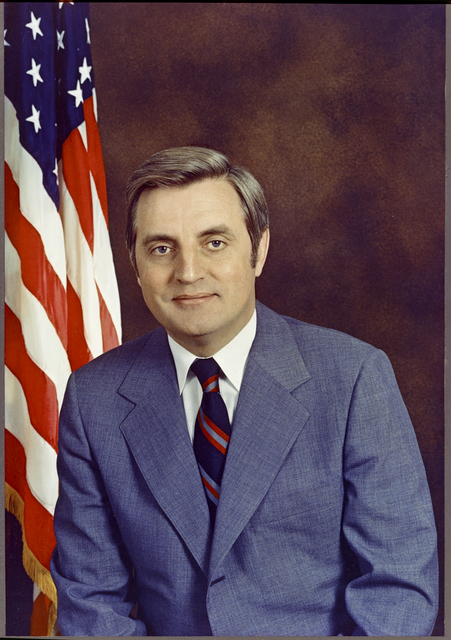 Walter F. Mondale Papers (1927-2004). Includes correspondence, legislative bill files, press and public relations files, speeches, meeting materials, trip files, photographs, sound recordings, and moving images from Mondale's service as United States Senator, Vice President of the United States, Ambassador to Japan, and Special Envoy to Indonesia. Fritz: The Walter Mondale Story: A Documentary Film, directed by Melody Gilbert. 1 color DVD, 60 minutes. Walter Mondale is a liberal Democrat, with a long and productive career in Minnesota and and national politics. He served as the state attorney general from 1960-1964. When Hubert Humphrey became vice president in 1964, Mondale was appointed to replace him in the U.S. Senate, where he served until 1977. In 1976, Jimmy Carter chose Mondale to be his vice president. In 1984, Mondale ran for president and became the first major-party candidate to choose a female running mate, Geraldine Ferraro. After the Mondale-Ferraro ticket lost to the incumbent Ronald Reagan, Mondale continued to be involved in politics, serving as U.S. ambassador to Japan from 1993 to 1996. He became a senate candidate again in 2002, taking over for Paul Wellstone when Senator Wellstone died in a plane crash. Mondale lost the Senate race to Norm Coleman.